Fermor Avenue is part of the Trans-Canada Highway and a major transportation corridor in southeast Winnipeg. The section of Fermor Avenue between St. Anne's Road and Archibald Street, including the bridge over the Seine River, is in poor condition and needs to be rehabilitated. 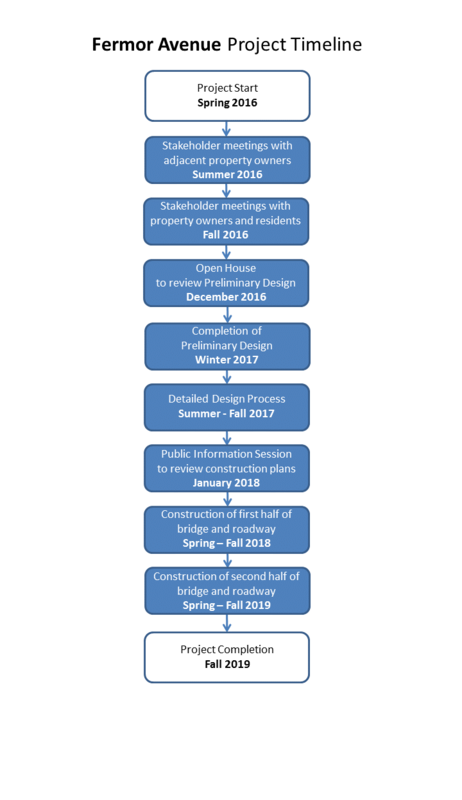 Construction began on the project in Spring 2018 following a preliminary design study, public engagement process and final design development. Major construction is on hold until Spring 2019 and is expected to be complete late next year. Construction on Fermor Avenue between St. Anne's Road and Archibald Street will begin on March 28, 2019. Traffic on Fermor will be reduced to one lane in each direction on March 31. We do not anticipate any major closures at Fermor and St. Anne's, however there will be numerous closures at the Fermor and Archibald intersection throughout this construction season. Reconstruction of several road segments. The major construction activities for 2018 have been completed and all lanes of traffic are now open. Several minor work activities are anticipated to occur over the winter. However, four lanes of traffic on Fermor will be maintained for the majority of the 2018/19 winter with intermittent lane closures for minor work activities. Stage 2 construction activities are anticipated to commence in spring of 2019. The major construction activities will consist of the rehabilitation of the south of the Fermor Bridge over the Seine River, the north half of the pedestrian-cyclist underpass and the remaining roadworks including the rehabilitation of the Archibald and St. Anne's intersection. To complete this work, median cross overs will be implemented and traffic will be down to two lanes until fall 2019. Street renewal is anticipated to begin in early May 2018 and weather permitting, be completed by the end of October 2019. The work will include rehabilitating the existing bridge, reconstructing Fermor Avenue with a new surface, including safety, geometric and access improvements, pedestrian and cyclist facility pathways including a new pedestrian-cyclist underpass through Fermor Avenue. Stage 2 (April through October 2019) – Construction of the north half of the pedestrian-cyclist underpass, south half of the bridge, and Fermor Avenue between St. Anne's Road and Archibald Street. For more information please see the construction notice posted under the documents tab. Thank you to everyone who completed the online survey that closed on January 24, 2018. We received 68 completed surveys. Participants now have an opportunity to see how their feedback was considered in a public engagement report and public engagement summary that are currently available under the documents tab. Thank you to all who attended the Fermor Open House on Tuesday December 13, 2016. Approximately 95 people attended the public open house and we received 32 online surveys and 26 exit surveys at the event. The online survey was available from November 30, 2016 to January 13, 2017. The online survey is now closed. The project team has analyzed the feedback received and an engagement summary report is now available. Fermor Avenue between St. Anne’s Road and Archibald Street was originally constructed in 1953 along with the bridge over the Seine River. The bridge and the roadway were both widened to four lanes in 1969. The bridge was rehabilitated and strengthened in 1984 to support heavier vehicles. The existing concrete pavement on this section of Fermor Avenue has generally reached the end of its life and needs to be replaced. Some of the pavement will be reused where possible. The existing bridge deck is rated in fair to poor condition and needs major rehabilitation work to provide a 75 year design life for the rehabilitated structure. A comprehensive rehabilitation of Fermor Avenue and the bridge over the Seine River will allow for geometric improvements to the roadway. These include reducing access points around the Fermor Avenue and St. Anne’s Road intersection, less abrupt curves, and longer acceleration and deceleration lanes connecting to Alpine Avenue. Modifications to the intersection of Fermor Avenue and Archibald Street to address the proximity of the intersection of Niakwa Road and Royal Salinger Road may occur at a later date. The existing pedestrian bridge across the Seine River immediately north of Fermor Avenue is prone to closure during spring flooding. The proposed road works will include construction of a new connection between the Niakwa Trail and the north sidewalk of the Fermor Avenue bridge to allow for easy crossing of the Seine River even during high water levels. A grade-separated pedestrian crossing of Fermor Avenue will also be provided to link Des Meurons Street and the Niakwa Trail to Niakwa Road. Why not build a completely new bridge instead of rehabilitating the existing one? The existing bridge deck is rated in poor condition. An extensive condition assessment of the bridge was completed as part of the preliminary design process. Ultimately, rehabilitation of the bridge was selected as the preferred course of action. The rehabilitation will extend the life of the structure and provide corridor improvements. Will access be maintained to existing businesses along Fermor Avenue? Access to businesses along Fermor Avenue and St. Anne’s Road will generally be maintained. There will be changes in the access points from Fermor Avenue to Alpine Avenue and short-term temporary closures. Why are the access points to Alpine Avenue from Fermor Avenue changing? The existing vehicle access points between Fermor Avenue and Alpine Avenue have a variety of safety concerns. The westernmost access point is too close to the intersection of Fermor Avenue and St. Anne’s Road and poses a high potential for vehicle accidents. The easternmost access point is too close to the Fermor Avenue Bridge over the Seine River for a proper acceleration lane and to allow vehicles to safely merge into traffic. Improving the double left turn lanes from westbound Fermor Avenue to St. Anne’s Road is challenging with the location of the central access point at Alpine Avenue and Seagrim Road. Allow improvements to the double left turn lanes on Fermor Avenue at St. Anne’s Road. Will Transit service be affected during construction? Route 16 service will be maintained throughout construction. The routing will change both during and after construction and some stops will be temporarily and permanently relocated. These changes are necessary as a result of the roadway modifications but will not substantially affect Transit service in the area. Routes 55 and 59 traveling along St. Anne's Road will not be affected by construction. The stops on St. Anne’s Road at Fermor Avenue may be temporarily relocated. What options were considered for a pedestrian and cycling crossing of Fermor Avenue? There is a strong demand for a pedestrian and cycling crossing of Fermor Avenue, roughly in line with Des Meurons Street to the north. The preliminary design study examined a variety of crossing options at this location, including above grade (bridge) and below grade (underpass) options. The bridge options would have required very long approach ramps that would have lengthened the crossing distance considerably. An underpass was found to be the preferred option, since there is sufficient room to provide clear sight lines for safety. What pedestrian and cycling improvements will be constructed as part of this project? Will Fermor Avenue remain open during construction? One lane of travel in each direction will remain open at all times during construction. Two lanes of travel in each direction through the St. Anne’s Road intersection will remain open for the majority of construction. Once the first phase of construction is complete in fall 2018, Fermor Avenue will be temporarily reopened to two lanes of travel in each direction for the winter of 2018-19. Traffic will then return to one lane in each direction for the 2019 construction season. Construction is expected to begin in spring 2018. The intersection of Fermor Avenue and St. Anne’s Road, the south side of Fermor Avenue between St. Anne’s Road and Archibald Street, and the north side of the Fermor Avenue bridge will be rehabilitated during the 2018 construction season. The north side of Fermor Avenue between St. Anne’s Road and Archibald Street and the south side of the Fermor Avenue bridge will be reconstructed/rehabilitated during the 2019 construction season. The project will open to traffic in fall 2019.